One of life’s under-rated pleasures is a walk in the woods through the misty morning air. 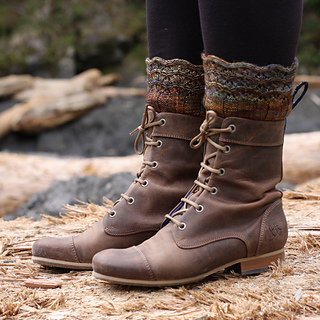 Such a trek should be undertaken in fine boots, preferably trimmed with a spirited touch of variegated lace boot cuffs. 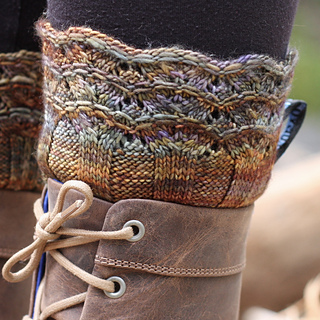 The cuffs are straight tubes knit in the round, top down. They are available in a variety of sizes to fit around just about any part of the leg. To fit leg circumference of 7¼ -8¾ (8¾-10¼, 10¼-11¾, 11¾-13, 13-14½, 14½-16, 16-17½)” / 18-22 (22-25.5, 25.5-29, 29-32.5, 32.5-36.5, 36.5-40, 40-43.5) cm, directions are given for Small, Medium, Long lengths S (M, L) with finished lengths of 4¼ (5¼, 6¼)” / 10.5 (13, 15.5)cm. To select the size, measure the widest part around the leg to be covered and select a circumference size where the leg size is equal to or less than the maximim size measurement. Keeping the preferred length in mind, identify the narrowest part around the leg on which the cuff will be worn. Ensure the lowest measurement in the size selected is less than or equal to the narrowest leg circumference measurement. If the cuff is for a curvy part of the leg, a shorter length will likely provide a better fit. Yarn: Malabrigo Mechita, Merino Wool, 410y (384m)/ 100g (3.5oz), “Mandragora”. US 1 (2.25 mm) double pointed knitting needles or size needed to obtain gauge, stitch marker, and tapestry needle. 36 sts/40 rows over 4” (10cm) in pattern.